Visit any trade show and you will most likely find signs, banners, posters and other forms of visual information striving to gain your attention. This type of information is the most important tool used to create awareness about anything. More specifically, banners are an excellent choice for this purpose because they can be any size, shape or color. Add to that the convenience of portability and you will see why banners are so popular at trade show events. Banners inform people at large that something is being launched or some event is going to happen. Quite often they look so stylish and colorful. If you are not able to find banners that can convey your message, then custom banners are meant to solve your problem. Custom banners will help you communicate your message in your own way. Choose a typeface that is easily legible and one that fits your type of business. San serif fonts and open styles such as Verdana tend to be more legible. Make your message clear. Not every image can be translated onto a sign or banner, so keep it simple. Because viewers have only seconds to read your message, some sign experts suggest that text should only be three to five words in length. Abbreviations should not be used unless they are popularly known. Whenever possible, text should be arranged horizontally rather than vertically. Maintain white space. An industry guideline is 30%-40% of the sign area should be blank space. Too much clutter distracts potential customers. There are certain color combinations that are more legible than others. However, the shade of the color is important, too. The most easily read combinations are black, dark blue or red text on a yellow or white background. Also, know that 8% of U.S. males are color-blind. It’s important to use color combinations that retain contrast when viewed by color-blind people. Blue and yellow, for example, are a good combination, but blue-green or aqua on white or gray are difficult combinations for a color blind person to read. Did You Know? A simple effect like adding a border around the viewing area is an economical way to dramatically improve your sign’s effectiveness. One study shows that viewers can read and comprehend a sign that has a border around its message 26% faster than a sign without one. Keep In Mind: Even within your budget confines, or the legal limits of your sign code, an experienced sign design professional can help you create an attractive and effective sign. As a general rule, capital letters are most easily recognized, but tend to be read individually. Lower case letters, on the other hand, are usually read as whole words or phrases. 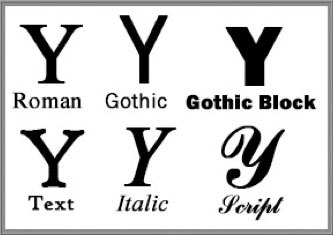 Sign design research designates six type styles as the most basic: Roman, Gothic, Gothic Block, Text, Italic and Script. Capital and lower case letters, with the exception of script styles, are generally equally legible. As a rule, the width of a letter’s horizontal stroke should be approximately 1/5 of its height.